Choose from our service packages listed below and be guaranteed of prompt, professional attention to your needs. Winterizing and Drive Service Prices include premium parts and materials. Tax and a 3% disposal fee are extra. Our winterizing services leave you turnkey-ready for spring! 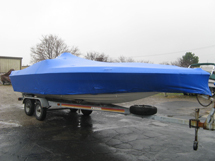 Applying shrink wrap on your boat will protect it from rain, snow, dirt and sun during the winter months. We shrink wrap all shapes and sizes of boats with premium shrink film and use proper techniques to maximize protection. We use support poles to prevent excessive snow weight from straining the boats windshield and rails. The shrink film is extended to the outer edge of the hull bottom to protect the top and side of hull from elements and to minimize chaffing caused by the draw string. We add vents and install mildew prevention kits to minimize mildew and odors from forming. Access doors are available to gain access anytime. All shrink wrapping is per linear foot. Mildew bags and access doors additional.